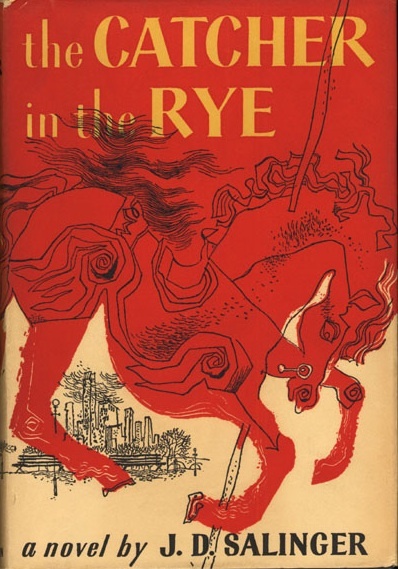 I can’t remember if I’ve previously read The Catcher in the Rye, and therefore I’m not sure if I cheated when I put it here in “Books I Should Have Read Before.” When I opened it for what I thought was the first time, I vaguely remembered some details as if I’d dreamed them: Pencey Prep, the phonies, some ice skating. Maybe everyone was right when they answered my, “I”ve never read it!” claims with, “That’s impossible — they force you to.” “They,” of course, are our teachers, the ones who have made this assignment fiction for as far back as anyone can remember. I wonder if that’s why I can only remember fragments. Did I never finish it? Did I get bored halfway through because Holden, that prissy dip, couldn’t just man up and do his homework like I was every day? Whether I made it through to the end or not, it’s obvious why the book failed me then and why it probably fails so many other kids: it’s not a book for kids. Well-intentioned English teachers have for years tried to assign books to their students that they can relate to, which unfortunately leads to books like Catcher, in all its sober and painful adult reflection, getting forced on kids simply because they are about kids. If I had to name my least favorite assignment books growing up, the ones about children may top the list (“Romeo and Juliet,” The Red Badge of Courage, Huckleberry Finn). When I was in school, my favorite assigned books were things like The Iliad because I liked to read about Ajax mowing down Trojans with a giant tree, or 1984 because it seemed to “get” the growing mistrust of systems that had started to take root in my 7th Grade mind. Kids have simple lives, fixed around the poles of school and home and weekends; kids have problems — extraordinary problems — to be sure, but the pleasures and pains of childhood revolve more around needs and wants being met (or not) and fun being had (or not). Kids haven’t yet started to map their vast interior lives the way we adults obsessively do. I think more about my goals and character flaws and life-track setbacks while in the shower any given morning than I ever did between Grades 1 and 12. This isn’t to say that those interior lives aren’t there; a child may feel what Holden feels but most likely hasn’t thought about those feelings the way Salinger does in the book. And if a child’s thoughts are primarily occupied with what to practically do with their time in any given moment, it seems a lot to expect them to take a break and ruminate on their life direction and society’s dishonesty and false promises, especially when they have to get to football practice. He’s saying that a focus on the immaterial, arguably irrelevant nettles in life is not just a distraction from what matters but a fatal one, a message that’s still true despite the vague pass he makes at Holden a few paragraphs later that possibly undermines it in the teenager’s mind. And in speaking to the falling man, Mr. Antolini gives Holden insight he can’t possibly understand until the moment when he realizes he’s falling. So, reading this at the age when one could be throwing paper clips at stenographers punches hard. Certainly, 30 is not too late to make a change, to make your life about its meaningful parts rather than struggling to define its outlines and architecture (and inevitably failing to find pleasure in that). She wakes up very easily. I mean you don’t have to yell at her or anything. All you have to do, practically, is sit down on the bed and say, “Wake up, Phoeb,” and bingo, she’s awake. “Holden!” she said right away. She put her arms around my neck and all. She’s very affectionate. I mean she’s quite affectionate, for a child. Sometimes she’s even too affectionate. I sort of gave her a kiss, and she said, “Whenja get home?’ She was glad as hell to see me. You could tell. Giving Holden something so important and then watching him leave it behind at the end is brutal. This makes Phoebe’s last-minute return so relieving, as she stubbornly, resolutely drags her suitcase along to the museum in a heroic attempt to secure her brother with the kind of undeterred nobility only young children have. Since Holden’s story is about missing the significance of important early steps, maybe it’s fitting that for many of us, the book itself is lost to the mists of childhood schoolwork. But at least it lasts. When Salinger died last year, many personal recollections centered on the book’s final moment: Holden happy in the rain, watching Phoebe going around and around on that carousel. We may have forgotten why it matters, but we’ve never, ever forgotten it. Did you cheat and read my post about a Separate Peace? I knew we were reading soulmates for a reason. Oh Susan, you’ve found friends here in the “No Required Reading” camp! If we have anything close to a philosophy it seems to be inching towards that. Our whole purpose here is to remind people how much fun it is to read; “fun” and “required” don’t often go well together! 🙂 I’m just glad to hear it from a teacher. And definitely give the book another try — I’m willing to bet you’ll love it. Let us know what you think once you’ve gone back to it!